Chevin Lodge is a lovely venue near Otley, on the outskirts of Leeds. 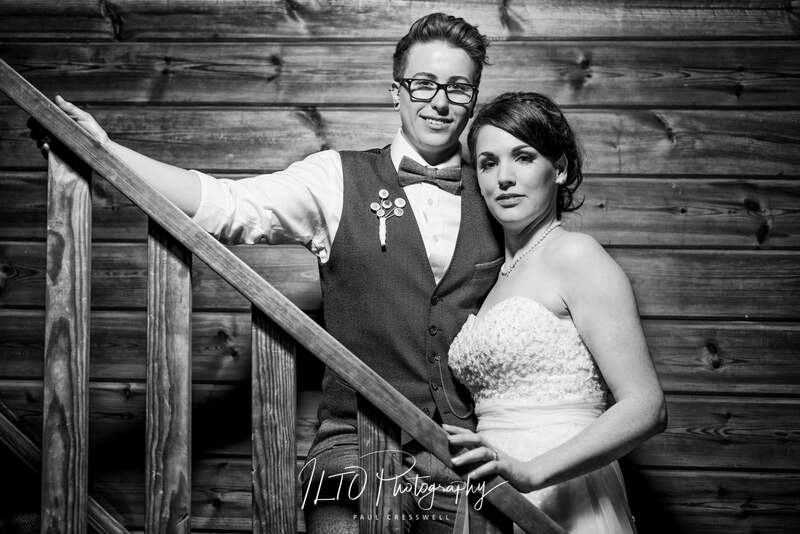 It’s been a few years since we first visited it, but when Kirsten and Emma got in touch, we knew Chevin Lodge was the perfect venue for the perfect couple. It’s a venue that’s not without its challenges though (not to mention that Emma is a keen photographer who can actually take a half decent shot!). Wherever you are in doors at Chevin Lodge, it’s dark. It has varnished wood hanging from every wall, so it pushes your skills and equipment. When you’re outdoors though, you’re rewarded with lakes, gardens, and the natural beauty that is Yorkshire. Kirsten and Emma both work for the ambulance service in West Yorkshire, and I can’t think of many people I’d trust more to help me in a time of need. That said, with all the training they have for life threatening incidents, the pressure of getting married certainly showed on the morning! Clare and I have never been asked to do a “First Touch” shot. So that in itself was a bit special to say the least, not to mention exciting. The funny thing was though, as soon as they’d done this, all their nerves left them both. Just like that! All Kirsten and Emma needed was that reassuring touch of the hand. It really is the little things that make the most important memories. Everything went according to plan, and before long the new Mrs. and Mrs. Moore were sipping bubbles. They were also spitting out confetti and laughing with their guests. tWedding breakfast and speeches done. Time to head outside for some shots of just the two of them. I took no more than 10 steps from the building, and the heavens opened – complete with thunder! Cheers Yorkshire! So, I had a quick scoot around the building. After a quick “trust me” conversation, we were on it again …. with some belting results too! The best part was though, within 30 minutes, it had all stopped and the sun was back out! Result!